Everyone has heard of "Land Barons" and the massive wealth they have accumulated. How did they make so much money on land? Did you ever think about buying a few acres of land when you've seen a city developing. You know, you're driving along and there are new houses going up and new shopping centers being built and you see this land that you know would be good to own. You investigate and you find that all that nice land is already owned and even if you could buy it the price would be over $100k / acre. Here is what happened. Before the houses and stores were being built people were planning and zoning the area. If you bought land you had to buy 100 or more acres and there were few roads to even find the land, but it was cheap. This is called raw land and there is no way to know when or if it will ever develop. When development starts and land prices begin to move up, some land holders put their acres up for sale. We call this pre-developed land because there are indications that further development is coming about 10 years into the future. My company is an expert in the selection of land in the path of growth. 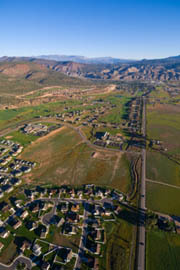 They use a 10 point system to determine which pre-developed land in what areas have the best chance of appreciation. Without this ability to select the correct land, someone's investment in land might not produce the appreciation needed for a $5,000 per month income after it is sold. In 1972, I purchased a new house in the sticks (Santee, CA) for $23,500. and today it is worth about $375,000. This is nice appreciation, but let me tell you about the mistake I made. I think it was around 1976 when I considered buying a residential lot in a new development called "The San Diego Country Estates" for about $3,000 and it was even deeper in the sticks. It was one of the better lots and it bordered the national forest on 2 sides. I decided not to do it because I would have needed a loan and didn't want another payment. Today, that lot is worth about $250,000. That is more than 80 times its cost in 30 years. If self directed IRA accounts existed during this time and I had the money in the account, I would own that land today and be a quarter million richer. The government has made this opportunity available for you today, so take advantage of it while you can. © Copyright 2008-2009 Unique Dynamics, Inc.